This Roasted Buffalo Shrimp is an easy, crowd-pleasing appetizer. 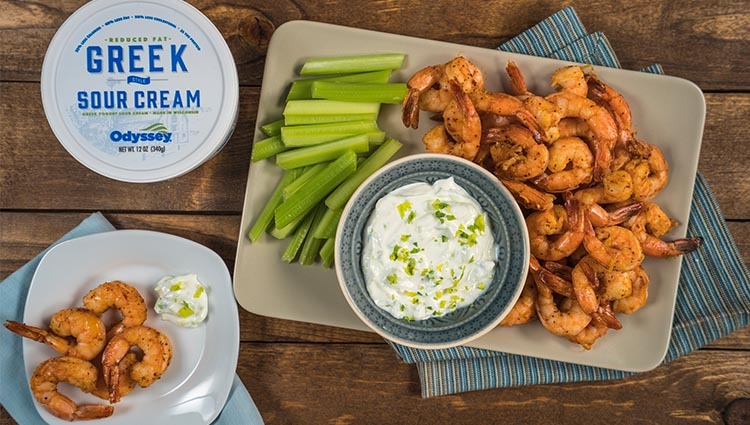 Served with our Greek version of sour cream that is so creamy, delicious and nutritious, you'll have your guests begging for more. Preheat oven to 450 degrees. Place 2 rimmed baking sheets in oven to heat. Stir together lemon, garlic, celery seeds, paprika, cayenne, 2 tsp salt, honey and oil in a large bowl. Add shrimp and toss to coat. Place shrimp in a single layer on hot pans. Roast, without flipping, until browned on bottoms and opaque throughout, about 5 minutes. Meanwhile, make the dip. Stir together lemon juice, sour cream, celery leaves and ¼ tsp salt.